Remember when we spent hours making scrapbooks? Then we started making cards. Now we're creating banners, cupcake decorations and napkins holders. This week, let's celebrate the paper that motivated us to create! In honor of paper, I'm sharing some of my recent favorite paper projects this week! But before showing anything off, I want to give some goods away! Leave me a comment and tell me what your favorite paper project is and one lucky winner will receive six of my DIY cards. That will make you either leave a comment or go to another website. Stop by all week and I'll choose a winner this weekend. Want to see more paper projects? Visit my DIY-Paper Pinterest board for more inspiration. My wedding would be nothing without Debbie! The cards are gorgeous!! 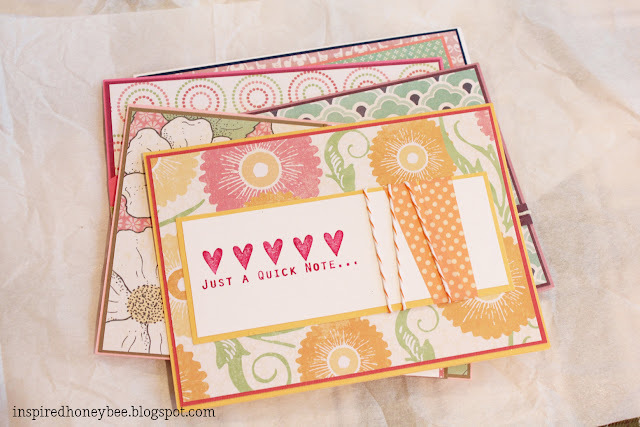 Really loving your use of twine & tape, mixed with pretty paper!